On Thursday, one day before the festival, there will be a welcome party again. 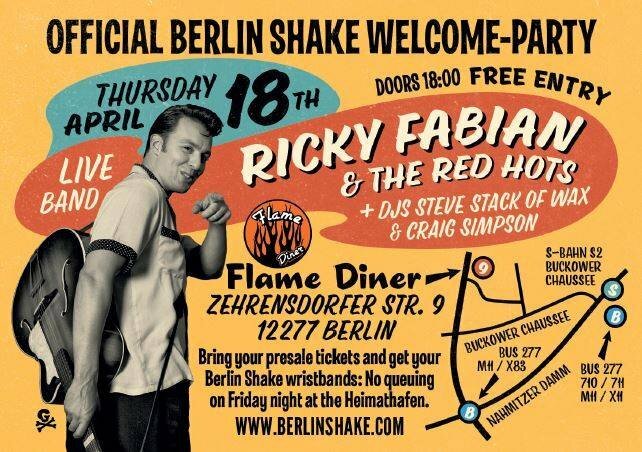 This time at the Flame Diner, where live music is brought to you by RICKY FABIAN & THE RED HOTS. Furthermore the two English DJs STEVE STACK OF WAX and CRAIG SIMPSON will spin the hottest rockin' records. So this will definitely be a great start for a even greater Rock'n'Roll weekend. And... it's free entrance so you can spend more Euros at the bar!